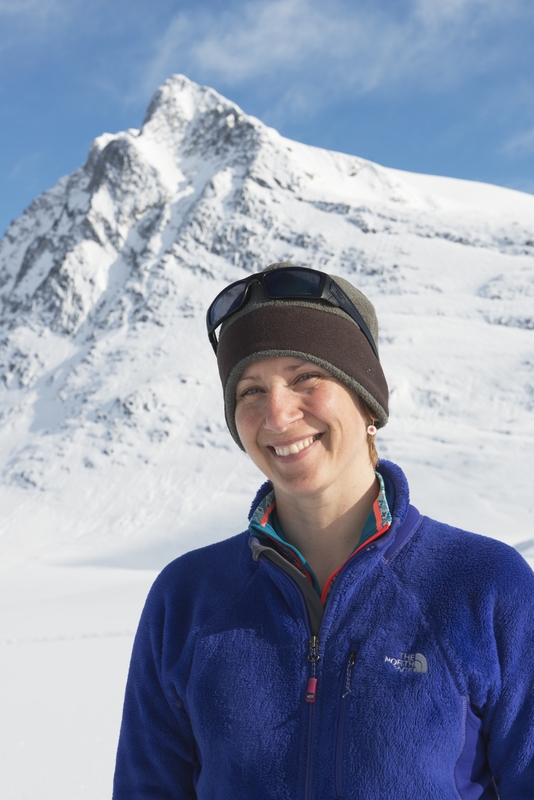 Kristin Laidre is currently a research scientist at the Polar Science Center, Applied Physics Lab, University of Washington. She is partially supported by the Greenland Institute of Natural Resources in Nuuk, Greenland. Her primary research interests lie in spatial modeling of movement and spatially-explicit foraging ecology of top marine predators. She is interested in how environmental features and habitat variables manifest themselves as constraints on movement and behavior, and how these constraints differentially impact demographics of sub-populations or metapopulations of marine species. Her research is focused on exploring these relationships using satellite and archival telemetry, in combination with remotely-sensed satellite data and quantitative spatial models in a Geographic Information System (GIS). Her research also links spatial environmental fluctuation to bioenergetic models and food webs in the marine ecosystem. Much of her research is focused in the high Arctic, where both short food chains and very limited and specific production periods strongly shape the behavior of top predators. Heide-Jørgensen, M. P, H. Stern, and K. L. Laidre. 2007. Dynamics of the sea ice edge in Davis Strait. Journal of Marine Systems 67:170-178. Heide-Jørgensen, M. P., M. Juul Simon, and K. L. Laidre. 2007. Estimates of large whale abundance in Greenland in September 2005. Journal of Cetacean Research and Management 9(2): 95-104. Heide-Jørgensen, M. P., and K. L. Laidre. 2007. Autumn-space use patterns of humpback whales (Megaptera novaeangliae) in West Greenland. Journal of Cetacean Research and Management 9(2):121-126. Laidre, K. L., M. P. Heide-Jørgensen, and T. G. Nielsen. 2007. The role of the bowhead whale as a predator in West Greenland. Marine Ecology Progress Series 346: 285-297. Heide-Jørgensen, M.P., K. L. Laidre, D. Borchers, F. Samara, and H. Stern. 2007. Increasing abundance of bowhead whales in West Greenland. Biology Letters 3: 577-580. Koski, W. R., M. P. Heide-Jørgensen, K. L. Laidre. 2006. Winter abundance of bowhead whales, Balaena mysticetus, in Hudson Strait in March 1981. Journal of Cetacean Research and Management 8(2): 139-144. Laidre K. L., and M. P. Heide-Jørgensen. 2005. Winter feeding intensity of narwhals. Marine Mammal Science 21(1): 45-57. Hobbs, R.C., K. L. Laidre, D. J. Vos, and B. A. Mahoney. 2005. Movements and area use of belugas, Delphinapterus leucas, in a subarctic Alaskan estuary. Arctic 58(4): 331-340. Laidre K. L., M. P. Heide-Jørgensen, M. L. Lodgson, R. C. Hobbs, R. Dietz, and G. R. VanBlaricom. 2004. Fractal analysis of narwhal space use patterns. Zoology 107(1): 3-11. Laidre K. L., M. P. Heide-Jørgensen, O. A. Jørgensen, and M. A. Treble. 2004. Deep ocean predation by a high Arctic cetacean. ICES Journal of Marine Science 61(3): 430-440. Heide-Jørgensen M. P. and K. L. Laidre. 2004. Declining open water refugia for top predators in Baffin Bay and adjacent waters. Ambio 33(8): 488-495. Heide-Jørgensen M. P., P. Richard, R Dietz, K. L. Laidre, J Orr, and H. C. Schmidt. 2003. An estimate of the fraction of belugas (Delphinapterus leucas) in the Canadian High Arctic that winter in West Greenland. Polar Biology 26: 318-326. Laidre K. L., M. P. Heide-Jørgensen, R. Dietz, R. C. Hobbs, and O. A. Jørgensen. 2003. Deep-diving by narwhals, Monodon monoceros: differences in foraging behavior between wintering areas? Marine Ecology Progress Series 261:269-281.